I’m not going to sit here and lie to you, up until the past 3 trips to Atlanta’s Hartsfield-Jackson International Airport, I was never a fan of connecting through there. Typically, I would arrive from New York’s LaGuardia in say Terminal A and need to get to Terminal LL. Ok, so maybe not LL, maybe C, but it seemed that way. From the time the aircraft pulls up to the gate and the captain turns off the fasten seatbelt sign, you’ve got exactly 83 seconds to get from Row 30 of an MD-88, up the jetway, RUN from one end of the terminal to the midpoint and scurry down the escalator to the train, taking chances that the train will be faster than you running the distance 2 terminals over, back up the escalator and to your already departed plane. Oh, throw in the roughly 3 million other people who flow through there on a monthly basis. However, as I said, in the last 3 trips through Atlanta, it hasn’t been bad at all. In fact, last year when transiting Atlanta, my departing gate was directly across from the arriving gate. This never happens to me. Ever. I bought a lottery ticket but, clearly my luck ran out because I’m writing this from my couch in Maine, not a beach that isn’t in Maine. Recently, I connected through Atlanta on a trip inbound from Portland, Maine en route to Tampa, Florida and then the reverse as I returned home. Each leg of the journey I was able to schedule flights to allow for over 2 hour layovers. No doubt, Atlanta is busy and almost reminds me of going to the mall at 3pm on Christmas Eve. Especially if you have 83 seconds to cover the ground stated above. However, we had plenty of time to get off the plane and find our gate before looking for some food. 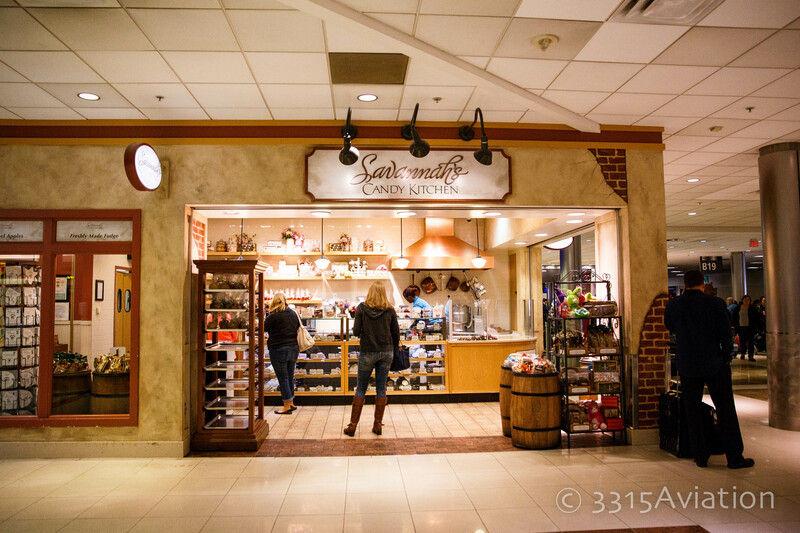 In each of the terminals, the food options are endless. Fast food options include McDonald’s, Chick-Fil-A, Panda Express, QDoba and Popeye’s among others. These are scattered throughout the terminals(Remember Terminal C for Chick-Fil-A, just throwing that out there). If you have more time to sit and relax over a beverage and food, the options are endless. In the centerpoint of each terminal is a food court of sorts with varying selections in each terminal. Options range from QDoba Mexican food, Piece of Cake cupcakes, cakes and more, to Nathan’s Hot Dogs, Great Wraps, Einstein Brothers Bagels among many others. However, at each centerpoint there is an upper level with more of a sit down type of dining. Selections range from Buffalo Wild Wings, Gordon Biersch and P.F. Chang’s. Whenever I travel, I always try to seek out some micro brews not available in Maine. If you’re a fan of an IPA, look no further than the Sweetwater Brewing Company Draft House and Grill. They have some amazing selections and there is nothing like an IPA to kick off vacation, at 10am. There are several other eateries that serve Sweetwater and other local offerings as well as the old standby, Samuel Adams. One of my favorites though, is Gordon Biersch, as mentioned in other airport reviews. Their Hefeweizen with a slight banana hint will not disappoint. I’m not entirely sure why I’m even writing about this, I rarely go in shops in an airport, unless it is a newsstand for a snack, which really doesn’t even count. 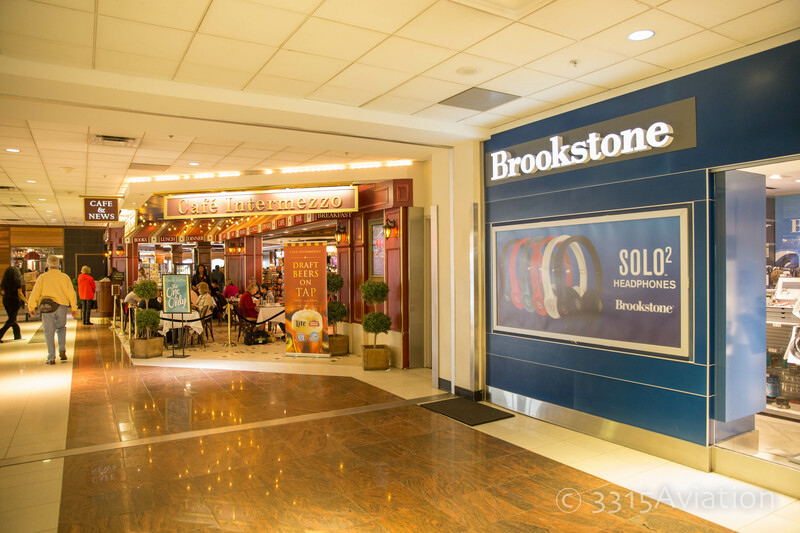 However, for those of you who can travel with one carryon item and then have the ability to stop at one of the 4 Brookstone’s located at Hartsfield-Jackson to buy some infrared back massager that also can scoop your dog’s poop, then I applaud you. There are several newsstands with magazines, refreshments and overpriced USB cables(trust me, I speak from personal experience), BestBuy vending machines, Coach, Michael Kors and the ever popular SPANX store. However, there are some very unique offerings here. Have a long layover and don’t want to sprawl out on the floor or across 4 seats? Minute Suites is calling your name. Located by gate B17, Minute Suites allows you to sleep, watch tv, read articles from 3315 Aviation on the web or just escape the hustle and bustle and relax in peace and quiet. It is advised to reserve ahead of time on their website as they are very popular. For those travelers wanting to stop and pray or meditate, there are 3 Interfaith Chapels located in the Atrium NW, E Centerpoint and F Mezzanine, welcoming all faiths. There are chaplains on site available for counseling. Also with 2 locations is XpresSpa, a spa offering relaxation massages, manicures, pedicures, facials and waxings. Just in case you want to reenact the scene from the 40 Year Old Virgin while waiting for your flight. If you can’t gain access to one of the airline lounges, you can always go to Terminal F Mezzanine and check out The Club at ATL. For a fee you can go in the lounge and relax while enjoying free snacks, drinks, wifi and even a shower. Construction on the modern terminal we all know and love started in 1977 and was completed in 1980. The concourses bring to mind LaGuardia Terminal C and D, low ceilings, barely any natural light coming in. The low ceilings make it feel cramped and noisier than you would expect. Throw in minimal windows and you’re stuck with fluorescent lighting. one of the USB ports didn’t work. The people working in the terminal, be it at concessions, gates or wherever, are some of the friendliest people despite the fact that they deal with grumpy air travelers all day. Other airports(*cough* LAGUARDIA *cough*) could learn a thing or 2 from them. As I said before, the concourses are big. REALLY BIG. If you’re connecting through there, make sure to wear comfortable shoes. High heels won’t help you, ladies, especially when you’re running to get 3 terminals over in 83 seconds. Or was it 86 seconds? If you are handicapped or have issues walking long distances, just flag over one of the go carts beeping their way through the terminals and they will gladly give you a ride to where you are going. If you’re a plane geek like I am, Atlanta is home to one of the most iconic sights in plane nerdisms. 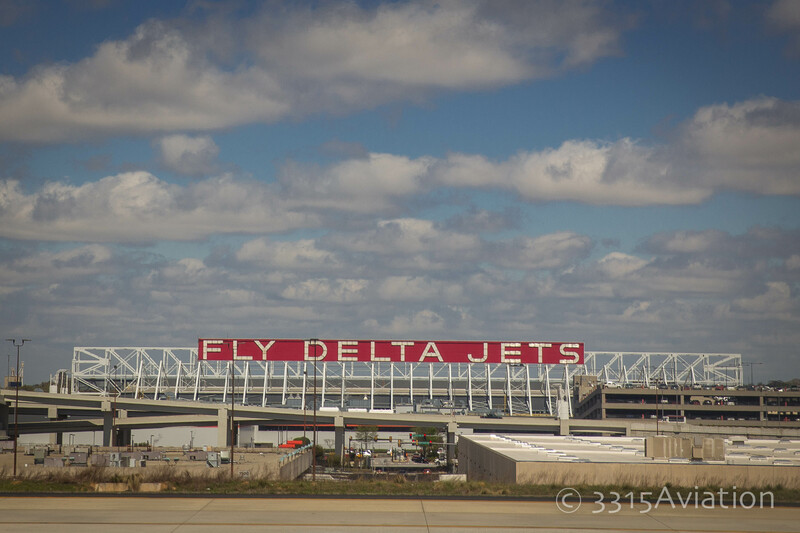 The “FLY DELTA JETS” sign on their hangar. It is an indication of their presence at the airport and how they make Atlanta home. Of all the trips I’ve made through there, I never could quite capture a good shot until this year. Also, I had never seen an Airbus A380-800 as up close and personal as I did. While taxiing my girlfriend who had the window seat points and says “Hey babe, it’s that plane you ran to catch in the airport”. I just about jumped out of my seat as I’m literally DIVING over her to get a shot. It isn’t how I envisioned my first photo of it, but I’ll take it. 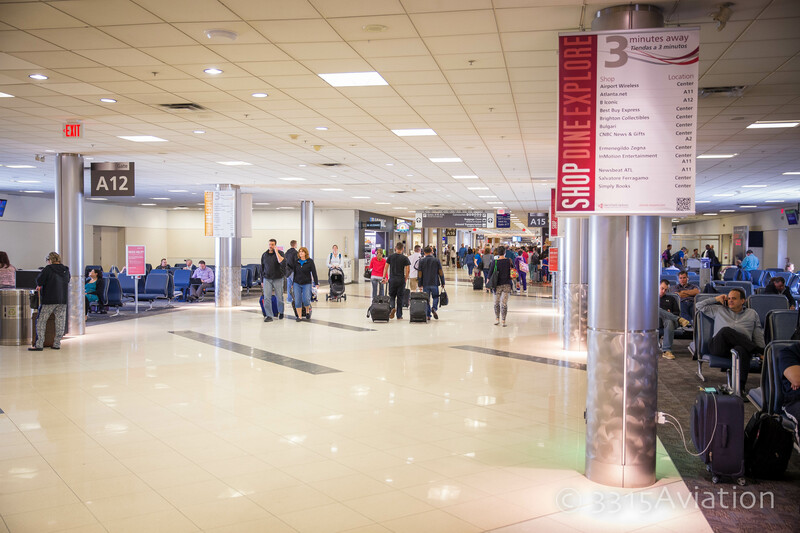 Hartsfield-Jackson has some great amenities to make your traveling life a lot easier. Concessions are top notch, catering to every taste. You may have to go to the other end of a terminal, or completely different terminal, but chances are you can find something to suit your tastes. Upgrades and renovations are ongoing but the gate seating and power stations need to be addressed. In the coming years, I would hope for more natural lighting to illuminate the concourses by way of ridding itself of the fading red paneling on the outside, and open the scuffed up sheet rock up to glass on the inside. You definitely get southern charm from the employees, which as stated before, other airports could definitely take notes from. Always willing to help or go the extra mile to make your visit more pleasant. Navigating is relatively easy with signs on posts telling of upcoming eateries and such as well as touch screen information kiosks. Did I mention Sweetwater Brewing and Chick Fil A? Oh yeah, the people watching is better than WalMart. Texas has a Chick fil A on every corner. Texas’ 343,262,912 points to Maine’s 4. Point. Set. Match. Great article!!!! I wish I had a reply for that. However, you are correct. Another great thing about ATL is that you can take the MARTA train straight to the airport. I live less than a mile from a station..Such a time and money saver. I agree with you. Makes it much easier getting to and from as well as a big savings on parking. Living in Maine we don’t have that luxury, unfortunately. However, I live 5 miles from the airport so I can get a cab or a friend to take me there/pick me up. My big thing is to take trips and be able to give insight as to the experience outside of security and how the flow is to get in.